Instead of spending our days rushing from location to location, this year has found us with our company of actors spending 4 days closeted in a warehouse in Salford. This large empty space had been transformed into a film set inspired by our amazing production designer and art director, Tony Boffey. The actors became a group of unlikely contestants, desperate to turn their troubled lives around, living and competing in a new reality TV game show, The Box. But the extreme rules and intense living environment forced them to face personal demons they’d long put to bed, as some began to question whether the show was everything they’d been told. 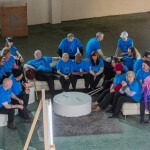 . .
Set in the near future, The Box is a powerful drama featuring 25 characters developed and cast almost entirely from the homeless and marginalised communities of Manchester. An intimate, ensemble character study, the actors have shared their hearts and souls as the film has been developed, giving us a bitter sweet story that captures the beauty and power of the human spirit. As welfare reforms and cuts to public services hit the most vulnerable in the UK, this film draws unnerving parallels with the realities of life for the marginalised and raises questions about the way we treat those who need our support the most. Moments of despair and desperation are contrasted with poignancy, humour and downright fun. We have been working with homeless and socially excluded people since 2007, coming up with new challenges and achievements for the actors every year. The characters, concept and storylines are developed through workshops with the aim of progressing broken lives and challenging public perceptions of homeless people. The Box, co-written by co-director Ed Lilly, Lauren Pouchly (producer) and co-director Joe Chambers, has been the most challenging to date. The long process of post production has begun and we are very excited for what will be a very powerful launch in July – watch out for the publicity!